DONETSK, Ukraine -- Ukraine said Russian tanks had flattened a small border town and pro-Russian rebels had made fresh gains in its east, as EU leaders signaled on Saturday they would threaten more sanctions against Moscow over the crisis. 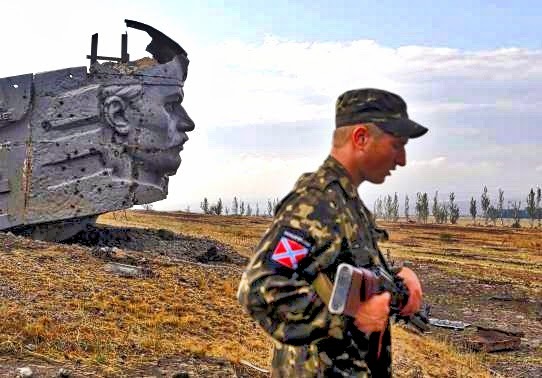 A Russian separatist stands near the damaged war memorial at Savur-Mohyla, a hill east of the city of Donetsk, Ukraine, August 28, 2014. Ukrainian President Petro Poroshenko, attending an EU summit in Brussels, said he was hoping for a political solution, but warned that his country was on the brink of full-scale war. Russia has repeatedly dismissed accusations from Kiev and Western powers that it has sent soldiers into its neighbor, or supported pro-Russian rebels fighting a five-month-old separatist war in Ukraine's east. But Ukraine military spokesman Colonel Andriy Lysenko told journalists in Kiev that Russian tanks had entered the small Ukrainian town of Novosvitlivka on the border with Russia and fired on every house. "We have information that virtually every house has been destroyed," Lysenko added, without giving details on when the reported attack took place. Ukraine's daily military briefings typically cover the previous 24 hours. Lysenko said the rebels had made new gains just east of the border city of Luhansk, one of the rebels' main strongholds, after opening up a new front in another area last week. "Direct military aggression by the Russian Federation in the east of Ukraine is continuing. The Russians are continuing to send military equipment and 'mercenaries'," Ukraine's defense and security council said in a separate Twitter post. Kiev and Western countries say recent rebel gains were the result of the arrival of armored columns of Russian troops, sent by Russian President Vladimir Putin to prop up a separatist rebellion that would otherwise have been near collapse. There was no immediate fresh comment from Russia on Saturday. Putin on Friday compared Kiev's drive to regain control of its rebellious eastern cities to the Nazi invasion of the Soviet Union in World War Two. EU leaders meeting in Brussels appointed Polish Prime Minister Donald Tusk as president of the European Council, giving hawkish Kremlin critics in Eastern Europe new influence in the bloc. According to a draft statement from the summit, the EU leaders were set to ask the European Commission and the EU's diplomatic service "to urgently undertake preparatory work" on further sanctions that could be implemented if necessary. French President Francois Hollande stressed that a failure by Russia to reverse a flow of weapons and troops into eastern Ukraine would force the bloc to impose new economic measures. "Are we going to let the situation worsen, until it leads to war?" Hollande said at a news conference. "Because that's the risk today. There is no time to waste." European Commission President Jose Manuel Barroso said the EU was prepared to toughen sanctions against Russia but also that it wanted a political deal to end the confrontation. "We are ready to take very strong and clear measures but we are keeping our doors open to a political solution," Barroso said at a news conference with Ukraine's president. Poroshenko said the crisis was close to a tipping point. "I think we are very close to the point of no return. The point of no return is full-scale war, which already happened on the territory controlled by separatists," he said. He added, however, that a trilateral meeting on Monday involving representatives of Kiev, Moscow and the European Union could produce a ceasefire. The crisis started when Ukraine's Moscow-backed president was ousted by street protests in February after he ditched a pact with the EU that would have moved the ex-Soviet republic firmly toward Europe and away from Russia. Russia denounced the pro-Western leadership that took over as "a fascist junta" and went on to annex Ukraine's Crimea peninsula. Pro-Russian separatists then rebelled in Ukraine's mainly Russian-speaking east in April, setting up 'people's republics' and declaring they wanted to join Russia. A senior U.N. human rights official said on Friday nearly 2,600 civilians, Ukrainian government forces and rebels had been killed in a conflict which has led to the biggest Russia-West crisis since the Cold War. In Kiev, Ukraine's Interior Minister Arsen Avakov said a group of pro-Ukrainian fighters had broken out of encirclement by pro-Russian rebels near Donetsk early on Saturday, though other reports suggested many remained trapped. Defense Minister Valery Heletey also ordered a clamp-down on information coming out of Ilovaysk, a town to the east of Donetsk. "As soon as the danger for Ukrainian units has passed, all open information for the current period relating to the withdrawal of forces from Ilovaysk will be published." Last week Russian rebels opened a new front in a separate, coastal territory along the Sea of Azov and pushed Ukrainian troops out of the town of Novoazovsk. They are now threatening the strategic port city of Mariupol. Several shots were fired on Saturday at a car carrying Alexander Zakharchenko, leader of the breakaway Donetsk People's Republic, but he escaped unscathed, another separatist leader, Sergei Kavtaradze, told Reuters. "Zakharchenko wasn't hurt. His driver was wounded and is being operated on," Kavtaradze said, adding that an operation was under way to catch whoever had fired the shots.